We care where you park. 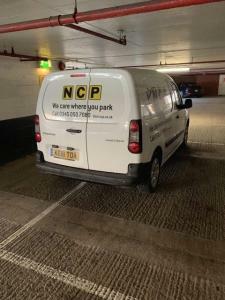 But don't care where we park. Idiot driving this with passenger window all shattered. Was originally a dark navy blue. Owner sold it to some sikh in bradford and ran into it recently. apparently its white now. A serious near miss, I thought it would be safer to cycle on the university campus . Apparently this young driver changed my perception. He turned left right in front of me into a car park when I was cycling down a steep road at a decent speed, at the moment it happened I thought I was going to end the week with a flat face but thankfully I braked harsh enough to avoid a direct collision but left a front wheel scratched on the rear of the car. I was in a shock and had to stop there looking at the driver and hoping for an apology. No apology! I went over to ask him if he realized what just happened, he said no. Shame!